Born 16 May 1918, at 31 Napier Street, South Bank, Middlesbrough, North Riding of Yorkshire [registered in Middlesbrough, North Riding, June 1918]. To Thomas and Mary (née Duffy), Seventh of nine children. Married to Bernadette Kathleen Murray [registered in Middlesbrough, March 1948]. Died 14 April 2000 at South Cleveland hospital, Marton Road, Middlesbrough, aged 81 years 334 days [registered in Redcar & Cleveland, April 2000]. Cremated at Teesside Crematorium. Height/Weight 5' 5", 11st. 0lbs . When Mannion left school at 14, he became an apprentice welder at Smith's Dock and then worked in a rolling mill. He had become a regular with Smith's Dock's FC (Teesside League) before moving on to South Bank St Peters FC. Wilf then signed amateur forms, then professional forms with Middlesbrough FC in September 1936. He continued to play for the team in the early years of the war while serving in the Auxiliary Fire Service before being called up, he appeared as a guest for both Tottenham Hotspur FC and AFC Bournemouth. He also appeared with the South African club Peninsular of Johannesburg whilst serving in that country. After returning from the war, Mannion clashed with Boro in 1948 over the contract system which he said chained players to their clubs, often for a pittance. Despite Arsenal FC wanting him, he demanded a move to Oldham Athletic FC, but bosses at the Teesside club put a record �25,000 price tag on him. So Mannion went on strike. He returned to the Middlesbrough side six months later. Wilf announced his retirement from football on 27 June 1954, having played 341 league matches, scoring 99 times. In December that year he returned to the game when he signed for Hull City AFC who paid Middlesbrough, who still held his registration, the then considerable sum of £4,500. He played sixteen league matches, scoring once. After some hard-hitting articles that Mannion wrote in his Sunday newspaper columns, he was suspended by the Football League who sought to make an example of him but, undeterred, Mannion took his talents into non league football with Poole Town FC in the summer of 1955. He later joined Cambridge United FC (Eastern Counties League) where his presence doubled attendances and before moving on to serve Kings Lynn FC and Haverhill Rovers FC. Distinctions He was awarded the Freedom of Redcar and Cleveland. The South Bank FC ground in Normanby Road is now a Community facility aptly named Golden Boy Green. Player number One of nine who became the 655th player (662) to appear for England. First match No. 227, 28 September 1946, Ireland 2 England 7, a British Championship match at Windsor Park, Donegall Avenue, Belfast, aged 28 years 135 days. Last match No. 265, 3 October 1951, England 2 France 2, a Festival of Britain Celebration match at Arsenal Stadium, Highbury, Islington, London, aged 33 years 140 days. Distinctions Wilf's parents were Irish, so Wilf could have played for the Ireland national team. The Second World War interrupted his career and he went to serve with the Green Howards 7th Battalion in Africa, Italy, Palestine, and then evacuated from Dunkirk. He took employment as a sales representative in Oldham during his strike in 1948. 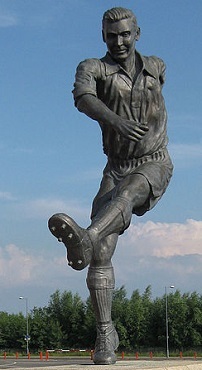 On his retirement in 1954, Boro held on to his registration, Wilf took employment as a columnist with a Sunday newspaper and penned a series of hard hitting articles in which he criticised the England selectors, the Football Association and club directors, opinions which were totally unheard of in the game at that time and, in the view of officialdom, gave more fuel to his rebellious reputation. He later ran the The Pied Piper pub in Stevenage and worked on an assembly line at Vauxhall Motors plant at Luton, he returned to the game as player manager of Lancashire Combination club Earlestown FC on October 15th 1960. He returned to Teesside a year later who became the a lbourer for ICI. - An English Football Internationalists' Who's Who. Douglas Lamming (1990). Hatton Press, p.167.